First of all, from the entire Club Penguin Gang we wish you a very Merry Christmas! We love you all! So what did you get for Christmas?! Leave a comment we want to hear all about your cool gifts! Ok back to business, Quest for the Golden Puffle is back at the Stage AGAIN! AND IT'S Christmas. But there is a pretty cool cheat in the catalog! 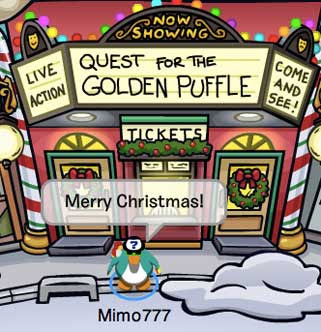 Click on the Golden Puffle! Schweet! We will be posting what we got for Christmas as soon as we can! I got an red ipod nano! WOOT! awesum! I got lots of really random stuff like games, books even a remote controlled dancing car!!!!! I loved my christmas this year. It was really fun. Its Christmas in Australia Yay! Thanks for asking! Be sure to tell me what you got for Christmas as well! but I now I got 10 cp toys. I love you all too CPG! We've had such a fun year! Thanks for all the help with cheats! & thanks for all the laughter & joy you give me! Zoe... Always making me craking my head of with ZoeZoeShowShow! 9China9...You are very nice to me & everyone! You always send me postcards! U Fride... Ahh your a very funny. Remember on Mimo Chat how you used to all me Stick Man? Now thats funny =D You also picked on me becuase you beat me at Card Jitzu becuase you unlocked cards! Ea12345...I have never spoken too you but you seem so cute! & Mimo... We live in such a long distance, we still keep a great fantastic realationship together! We are Thick as Theives! And one of these days I will find out your true identity! I got the iCarly DS game, the Brady Bunch DVD collection (Every episode) (YES I know it is so old but I love old TV shows! Ask your parents if they know 'Little house on the peire or 'Diffrent Strokes' Or 'I dream of Jeanie' or 'Bewitched' lol! I also got a towel & $500! merry christmas mimo and to all the cpg mods! and all my buds on cp... and EVERYONE THAS EVER POSTED A COMMENT! Did you know that if you go to the furniture catalog dec-jan and on page 4 you click on the right hand snow tower near the word SNOW FORT you could buy a fireplace? for xmas i got a puffle toy series 6 a series 3 mix and match halo 3 odst scate 2 dg hero lots more and bye the.........MIMO YOU ROCK!! Hey u know in the treasure book 6 there is a page with a question mark? when u hav unlocked 5 items u get that page and you get 2 extra FREE items to pick. So in total you get to choose 4 items. I got a blue puffle, a cheerleader toy and a set of club penguin figures! I also have 16 other figures, a blue puffe hoody, a purple puffle and the club penguin ds game! I luv club penguin!!!!! i got xbox360, 5 games for it and other stuff. i got about 30 club penguin things! I got a hot wires game for christmas! You can make a circuit withh lots of different pieces! My favourite is one where you can get FM radio on! I got 2 plush toys! i got a DSi and epf game! I dont know what i got yet: I'm allowed to wake my parents up at 6:30, and its 6:00, and i'v e been awake since 4:30 cuz i couldnt sleep. I did get some stuff from my grandma earlier though. I got a movie, and MP3 player, (but it doesn't work, WAAAH!) and SCRIBBENAUTS!!!!!! WOOOT! Merry Christmas CPG, and all of CPG fans out there!! So far, I got new Adio shoes (they are mostly black with some pink and white laces), clothes, jewelry, and a Ping Pong table!!!! Less than 2 hours left of Christmas! OMG! we opened our pressies on xmas eve! i got an ipod nano! so cool! for christmas i got a trip to disney world for 4 days. I cant wait to go.. MeRrY cHrIsTmAs mimo 777 and all the rest of you!! I'm so tired of this play! I never really liked it. But then again this is my opinion and I don't want to bring anyone down. I got money for Christmas! Cha ching! I dont know what i got but later i will post it here. I have to wait for my family to open my presents. As soon as I "Joyfully" rip them I will tell you. hey mimo this totally ROCKS!!! guess why, im typing this from my new mini laptop i got 4 Christmas!! I got a guitar, a really cute 2010 calendar,books,a metal detector, walkie talkies, webkinzs,and a directors chair! This was an awesome Xmas!!!!!!!! I know my sister got me card jitsu cards..... lol. CP obsessed. And I havent opened the rest yet. I got 15$ iTunes giftcard too. I spent it on a 14.99 movie. Is there tax in iTunes? lol! OMG! I DON'T CELEBRATE CHRISTMAS BUT I DO CELEBRATE CHANUKAH AND I GOT 2 THINGS I REALLY WANTED! FIRST, THE ONE I WANTED THE MOST, TICKETS TO THIS BROADWAY SHOW, WICKED, ONLY I'M NOT SEEING IT ON BROADWAY I'M SEEING IT IN THIS THEATER IN PROVIDENCE RHODE ISLAND. BUT I'M LIKE OBSESSED WITH IT AND I'M SO EXCITED! SECOND I GOT A NECKLACE WITH A STAR OF DAVID ON IT. NOT AS EXCITEING BUT STILL. ANYWAY I GOT MORE PRESENTS THAN THAT IT'S JUST THOSE TWO WERE THE ONES I REALLY WANTED. Happy Christmas to you all too! I got some video games and some CP stuff. Money and Books. Hope you all got what you wanted! I got a bunch of gifts! Way too many to post on here! One of my gifts was a snowboard! I can't wait to test it! Merry X-Mas everyone! For me Christmas isn't here yet it's Christmas Eve for me. Awww that's too bad! I hope you all get awesome gifts! The thing is my logo. Sing Out didn't really fit. Like i said before the ortodox christmas is later(on january 7th)and we get presents for new year not for christmas! For Christmas my brother gave me a pencil set.Also i got card games. coolness! stand on the yellow puffle mat in front of the golden puffle and a boulder rolls by! Woot! I got Mind Flex, Legos, Clue Secrets and Spies, and best of all, A BRAND NEW LAPTOP! i got lots of clothes and games and blankets,ooh and my favorite CANDY!! i got clothes, makeup, jewlery, and money! I GOT CP SERIES 5, AN IMAC, GH 5, SOME WII GAMES, SOME DS GAMES, NEW SHOES, MOVIES, CANDY, AND GIFT CARDS. I got Nintendo Dsi, The Legend of Zelda: Spirit Tracks and Scribblenauts! What did you get mimo? p.s. I am playing internet on my DSi! MERRY CHRISTMAS!!!! I got a DSi! And a Wii! And yesterday, I got MY OWN LAPTOP! (I have one of those before I even have a cell phone!!) It's an HP mimi, I still need to set it up. Oh, and a CP plush, a 12th fish. (I got waay more plush on Tuesday...like 7!) I also got a lava lamp, some candy, and a Snuggie, lol! I got more, but I don't wanna bore you to tears. C u l8r, and HAPPY HOLIDAYS! canu hav a end of 2009 party on cp too? I got a DSi, Kaya(American Girl Doll), her horse(Steps High), Jenga, Planet Earth on Blu-ray and DVD, a book called The Magician's Elephant, DS games and other stuff I haven't gotten yet. Oh yeah candy too. Mimo and all of Club Penguin Gang Merry Christmas and do you believe in Santa? got rock band2!!! and club penguin DS game!! i love christmas! Hey Mimo! I got an ipod touch 8GB! It rocks! Its charging now! LOL! i got a bunch of gift cards,a book that makes fun of twilight, 2 AWSOME BLACK AND WHITE PUFFLES, a tintin book, a harry potter toy, a shirt, candy a magic 8 ball, and a flip video camra!!!!!!!! I got a laptop for Xmas! i got a board game, two clothes, crocs, $20, New Super Mario Bros. Wii, Diary of a wimpy kid do-it-yourself book, and... Scribblenauts! We give presets in new year in my country Turkey. But im sure i have a hamster! I got 2 club penguin toys, (The reindeer and the sleepy guy), a Chicago Bears wallet with $130 in it, and a Chicago Bears ornament. Merry Christmas! I got a Samsung Tocco Lite! I'm Using it now, it's awesome! No cash this year, he he. Hey Mimo! If you've heard of Build-a-Bear's then I got one! If u don't know what that is , they're bears u can make in a shop and I got one with peace signs on it! What did you get? I got a clubpenguin joke book cp ds game with code three cp cards and an underwater camra and lot's more. Merry Christmas everyone have a great day! For Christmas I got 4GB flash drive, 1 DS game, 2 Wii games, socks (lol), cool shirts and pants, a few books, a Club Penguin mix and match toy, and a cord to hook up my laptop to my TV. Cool eh? MIMO i have finally mastered it on easy! im gonna do it on hard now! i also got an xbox 360! I got a Mermaid Club Pengui Doll :) and now my penguin has a wig and tail :D I also got the Phineas and Ferb CD and I love it!! The movie Up, some books, Head Phones and Littlest Petshops are some other stuff I got. Video games galore here! Merry Christmas Everyone! Laptop, igloo play set,2X mix and match,Jester plush,aunt arctic plush,squidoid plush,Gary in snow trecker. Im lucky and thats all i got! I got sensei and a little black puffle! I have heard of Build-a-Bear! Most ppl my age have grown out of them, but I still collect them. You know how many I have? 29! My latest one was the blue one with rainbow peace signs on them her name is Hope. Still need to stuff her and get her clothes though! Merry Christmas! I got a white puffle toy! I got a dumb present!! Omg mimo! lol im rlly excited i got an ipod touch and rockband 2 and the beatkes rockband and a bunch of northface coats! Lol i wuz so excited i almost peed my pants - lol maybe they should've given me pants az a present. . .
Guys i got gears of war 2, 200$, new super mario bros wii, ipod touch generation and a 120GB harddrive for x-box 360. I got a snuggie, a wii, and a few games. I got a Zune, a calendar, a daily planner (from my little sister), two cool jackets, some fuzzy bunny slippers (love 'em! ), a pair of ducky pajamas (which I also love), another pair of pajamas, a fedora hat, a Nintendo DS case, a CD (Natalie Grant), this Revolve Bible that I've wanted for a long time, and a ticket to go on a ski trip. I love them all! P.S. LOL, I have a lot of family! I got an iPod touch! It rocks! I got a laptop, A new DS game(Scribblenauts), 4 packs of gum, a ten gallon aquarium, and lots of other cool stuff! I got 2 chocolate bars, hair dryer, 2 giant stuffed horses, a bunch of breyer horses, 5 DSi games, nail polish, 2 DVD's, a pink Snuggie, $20, and those cool red pajamas with the flap on the back(it matches my red pajama stuffed penguin) and my horse Princess got a bunch of sunflower seeds(she loves those) and that's all... and then on Club Penguin I got 99 of those chairs! Ask your parents if they know little house on the priere! Hey! It's currently 10:55 and it's boxing day over here in the uk. I got... Pixarpedia, Book about space, Spongebob Annual 2010, Beano Annual 2010, Spongebob Activity Pack, £40, A new silver computer (Mac Design), A house (Just kidding! ), Up book of the fillm, Christmas Carol book of the film, Awesome Unamed book, Malteesers, Chocolate, Jaffa Cakes, Spongebob Sticker Set, The world of Kong, The Beano Mission Mayhem, New Super Mario Bros Wii, Issue 35 of Beano Max, Poke'mon Puzzle Book, Poke'mon Annual 2010. The script is still for Norman Swarm! And is it EA12345 or EA1234? Someone answer please, thanks! i got alot of game stop cards, cash, a WWII helm (AMERICA) and some clothes, candy, and this new kind of chap stick that looks like a soda can and it smells like diferent soda like, Mtn. dew (and diet), Dr. Pepper, Mug Root beer, ans pepsi! Cool. Its actually my first time to see this play since i haven't been in CP for so long after fogetting my username and password to my CP. This is what i got for Christmas. it was a wet xmas for me in australia...i got: a ripstik,mario kart wii,books,dvds,$40 gift card and clothes.btw i am a total aussie cp nerd! I got Call of duty Modern Warfare 2 for PS3! I also got club penguin toys and cards for my account. We Wish You A Merry Christmas Club Penguin Gang! I got a ps3 and $400, it is so cool, because now i have a wii, a xbox 360, ipod touch, ipod nano, ds light, and a ps3. i lucked out BIG TIME!! Hey mimo! for christmas igo the club penguin igloo set, 7 clubpenguin chaacters 5 clubpenguin plush toys and all the puffles in plush toys! I'm addicted to club penguin! I got the New Super Mario Bros. Wii from my parents and Mario and Sonic at the Winter Olympic Games from Santa. Cool eh? Well waddle on! hey mimo juz wondering do u have facebook or twitter account?